Would you believe that coffee can make a difference? Because of you, Tsehainesh’s coffee shop is flourishing. Just 3 months ago Tsehainesh did not have work. Living in a rented room with her husband, she was home caring for her tiny daughter while her husband searched for day labor work in Hosanna, Ethiopia. Tsehainesh was frustrated — her baby daughter, Bereket, needed to begin solid foods and they didn’t have enough resources to provide nutrient-rich food for her. Tsehainesh KNEW she had skills to make and sell coffee. But, she had no capital to create a tiny shop (tinish suk) on the edge of the town’s bustling market space. And then you stepped in, and Tsehainesh’s life changed. 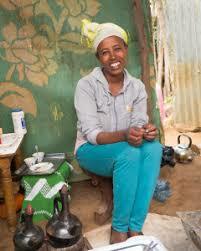 Your donation made it possible for her to receive a small business grant through the Roots Ethiopia IGA program. She put her first installment of funds into building her small roadside shop with a wood frame covered with tarps. Adding chairs, she has a simple 2-3 person capacity outdoor coffee shop. Open 6 days a week, she sells coffee and a local favorite barley drink called shameta. Her nutritious barley drink is so popular on market day she sells out within 2 hours! She will use her second installment of IGA funds to buy more barley and sell more shameta. I met Tsehainesh last week in Ethiopia. Can you believe a life can be transformed within weeks of a business start-up grant? Your support makes this transformation possible. YOU make an impact! Your donations create these changes time and time again — $325 means a whole new future for a family. I think you’ll agree that this is the kind of donation that offers an opportunity of great magnitude for hardworking families who are ready to change their own futures. Please give generously during this giving season. Your donations are put right to work for the children and families of Ethiopia. Your support means so much to Roots Ethiopia, but more importantly, it means so much to the families who are ready to work! Next Next post: Meet Eyerusalem, a 5th Grader with Big Dreams!